We had an idea to pass the big cornice to the right from « Рыжего вывала » (Red fall), on the fhotos a crack was seen in the center of the cornice. Looking closely, it turned to be not a crack, but a trace of fallen patch. We said goodbye to the beautiful idea and ascended to the summit. 2-3 Go along the ledge to the right, then move upwards, to the direction of a tree, move to the left from the tree, and go to the ledge, to the base of the corner. By the corner go upwards, 10m 5с, to the deciduous tree. Belay. 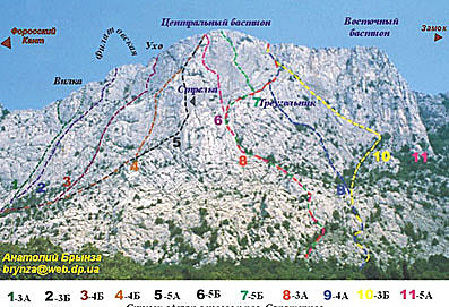 50m Climbing is mainly easy 10m 5с. Belay – pins, nuts. 3-4 go upwards 7-8m 5с by the corner, go to the easy walls, and move upwards to the right 20m, belay is on the ledge a bit above the thin deciduous tree. ~30m. 4-5 go upwards by the slab with short cracks, after the ledge go upwards and to the left, climbing + AID, go to the ledge on the top of the corner. Belay, there is a bolt.40m 6а А 2. 5-6 From the belay go upwards by the crack to the bolt. From the bolt swing to the right 2-3m, and climb by the slab to the short crack with grass. Then AID by the slab 65-70°, anchors, pins, there are holes for sky hooks 8mm, go to the red stain. Here the slab becomes more gently sloping, and the terrain becomes richer. Under the overhang traverse to the right, and habing bypassed the cornice, go upwards by the overhanging corner, go to the plateau. 50m 6 вА 3. Gear – pins, anchors, stoppers, friends, sky hooks, at least 2 х hole ones.